SJ Matthews, a candidate for SA president, works with a member of her campaign team to tape up posters Monday. 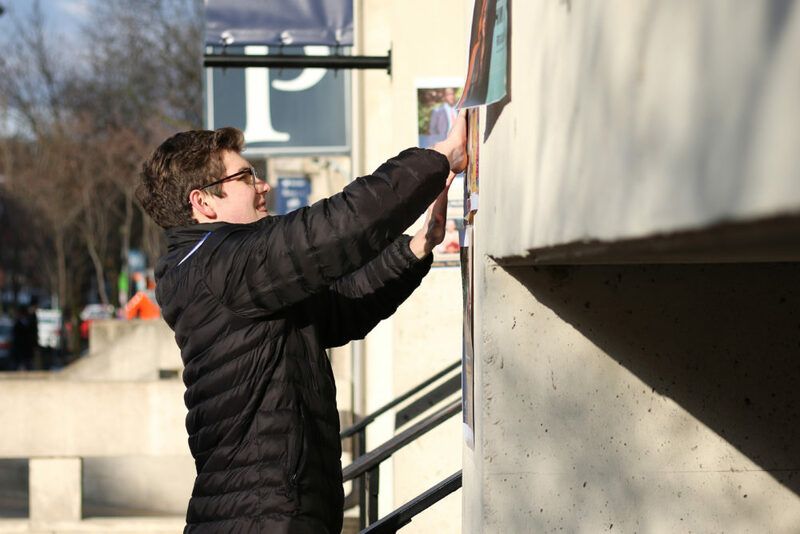 Candidates running to serve on the Student Association dashed out of Kogan Plaza Monday morning to plaster their campaign posters around campus. The yearly 8 a.m. postering event officially kicks off SA campaign season. This year’s event was originally scheduled for Friday but was postponed because candidates said they needed more time to gather supplies after finishing up collecting signatures the day before, James Ingram, the chairman of the Joint Elections Commission, said. 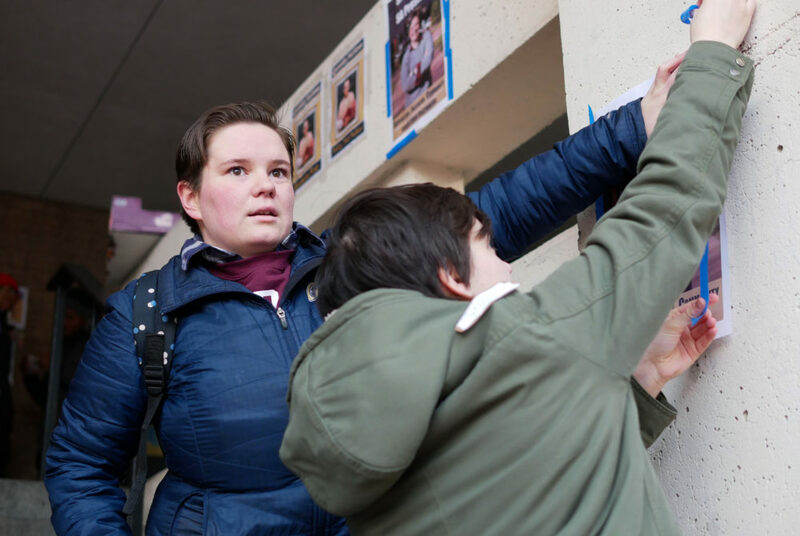 Candidates running for the SA’s top spots dashed out of Kogan Plaza Monday morning for an annual postering event. Every candidate running for SA president and executive vice president arrived with their respective campaign teams to secure popular spots where they can plaster their posters. 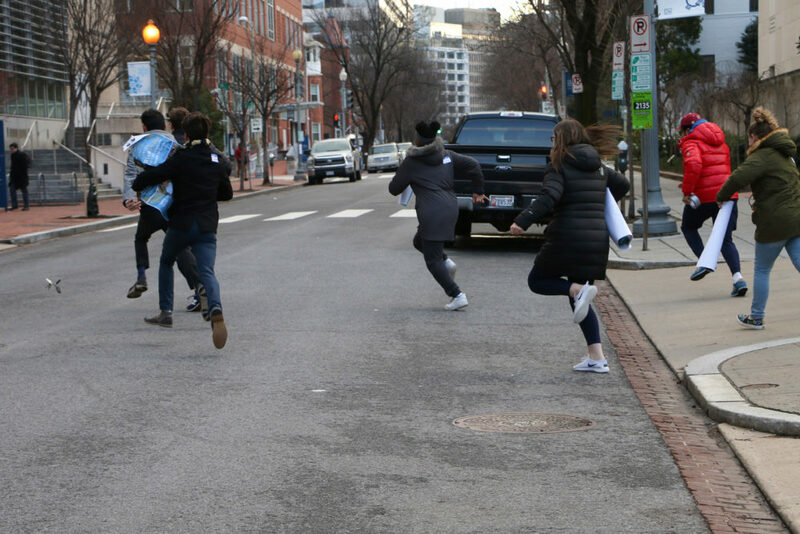 Candidates gathered in Kogan in about 30-degree weather to strategize where to tack their posters around campus. Jillian Wolons, the campaign manager for SA presidential candidate Nicole Cennamo, said about 10 members of the campaign team planned to split up and cover the Mount Vernon Campus, University Yard, Rome Hall and the Marvin Center. “I don’t think you need any more than that because when you have five people standing around, you don’t need that,” she said. By about 7:57 a.m., students had lined up underneath the arch in Kogan. Ingram wished the candidates good luck before they darted off to secure popular spots around campus. 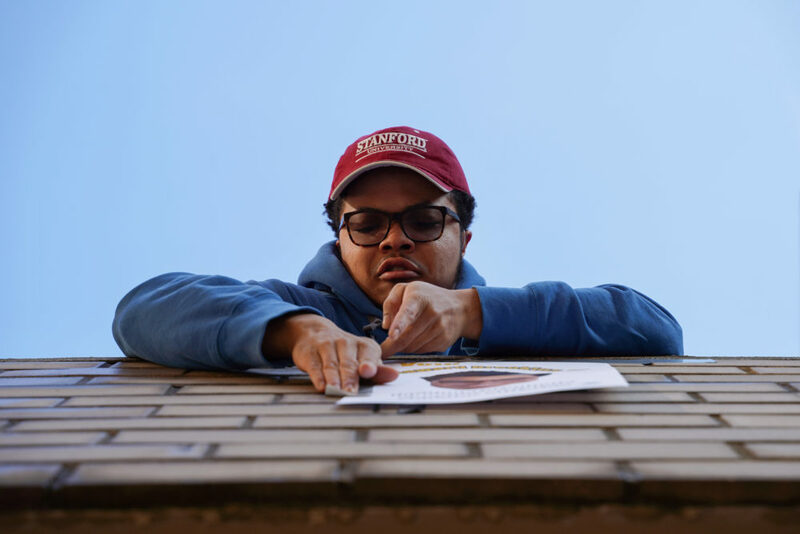 Sophomore Howard Brookins, running for an undergraduate-at-large senator seat, stands on the balcony of the Academic Center to hang up campaign posters. SA Sen. Amy Martin, ESIA-U and a candidate for executive vice president, said she lent tape to some other candidates because she wants to maintain a friendly atmosphere in an often contentious race. She said that when she was a freshman running for an SA Senate seat last year, she arrived to postering day by herself. Students darted to the Marvin Center, Rome Hall and University Yard, some of the most popular places to plaster posters. This year, students running for positions that represent the law school can also poster in the law school, which they were not previously allowed to do. But Ingram, the JEC chairman, said candidates did not poster in the law school Monday because the school is on spring break, and the commission wanted to receive approval from the Student Bar Association. 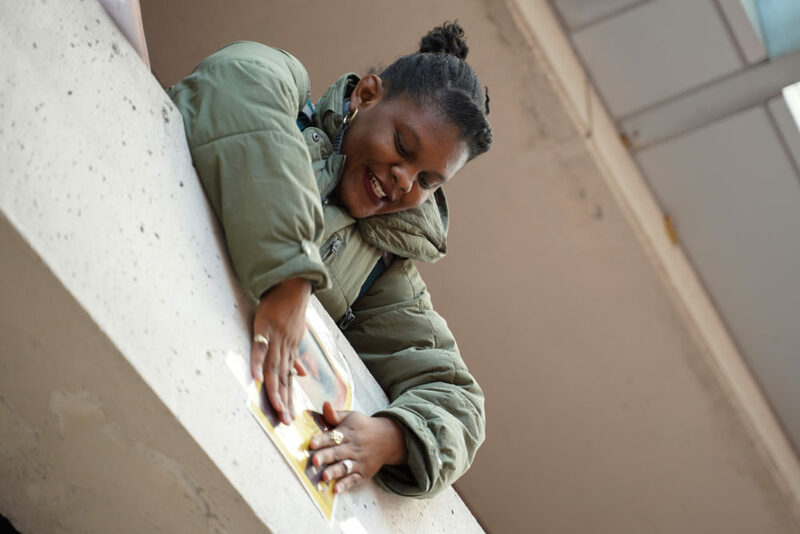 SA Sen. ShanTorrian Underwood, CCAS-U and a candidate for SA president, tapes posters on the Marvin Center Monday morning. SA Sen. ShanTorrian Underwood, CCAS-U and a candidate for SA president, said she wanted to hang posters to put a face to her name, especially for people who might not be able to follow her campaign on social media. She said members of her team will also head to the Vern later in the day to continue postering. “We want to break down those barriers so students can see who’s running, who wants to represent them and what their campaign platform is,” she said. Candidates and their supporters slowly left the event. Posters covered the brick walls on the H Street entrance of Marvin, some areas of University Yard and Rome and Philips halls. Quentin McHoes, a candidate for executive vice president, said posters are a “tangible” item candidates can use to promote their campaign outside social media. But he said postering day is not as important as other election events later this month, like a candidate debate and town halls where candidates discuss platform points. “You see a lot of people using a lot of the same buzzwords that have been recycled on posters and candidates’ platforms in the past but with the debate, for example, you have the opportunity to engage in what elections are all about – a contest of ideas,” he said. SA Sen. George Glass, U-at-Large, posters outside the Marvin Center Monday morning. Matthews said postering day is an opportunity for students who are not running for the SA to get involved in elections and show support for different candidates.